The new year for anglophones normally involves less food, extra exercise, shiny gold resolutions. Earnest lifestyle changes kick in, as they mutter about pounds gained over Christmas. Also normally, by mid-January all motivation has seeped away with the draughts of cold air, and biscuits are allowed back in the kitchen. The French make no pretence at such deprivation. On the first of January, they polish off the last of the Christmas log, pack away their candied chestnuts and promptly start munching on a galette des rois, a circle of puff pastry sandwiching sweet almond cream. Anyone who might dare to hint at a diet is tempted with a fat golden slice, told to join in the fun. For the galette is also a game: whoever gets the bean (or lucky charm) hidden in sweet centre is king for a day, as demonstrated by their paper crown. Supposedly for the Magi, it ought to be eaten on January 6th. Not to do things by halves, the French eat buttery slabs of royal tart for a whole month. Which means lots of almond cream for me to make at the patisserie – equal parts soft butter, sugar, ground almonds and eggs, whisked together in that order, livened up with a splash of rum. We have pistachio and chocolate and… I’m sick of them already. But this, this I have been dreaming about. The savoury version, still with its burnished bronze crust and crinkly edges, still with the all-butter pastry. that hides a proper surprise and not just a fève (the magic bean). Inside are layers of ricotta, swirls of tomato, spikes of pepper, with a sprinkle of olives and basil for good measure. And of course, melted mozzarella. With the spirals cut into the top, it’s the prettiest most delicate interpretation of pizza you ever saw. There was an almond hidden inside. But I’m not sure if I’m sharing, so I guess I’m king by default. Divine right and all that. In a small bowl, mix ricotta, egg, almonds, parmesan; salt and pepper to taste. Slice the pepper and mozzarella, halve the olives. 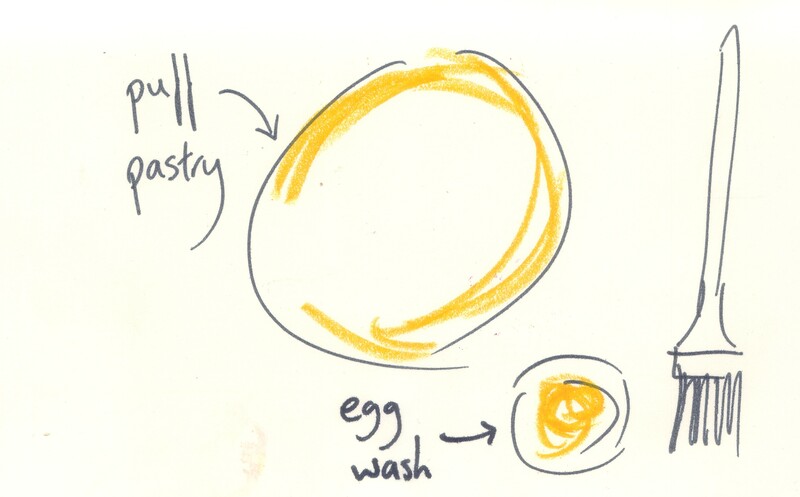 Crack the other egg into a mug with a pinch of salt, whisk to combine. Cut two 25cm circles of puff pastry. Put one in the fridge. Brush some egg wash around the edge of the other: about 2cm. Leaving this as a border, spread the ricotta mixture in the middle, thickly and evenly. 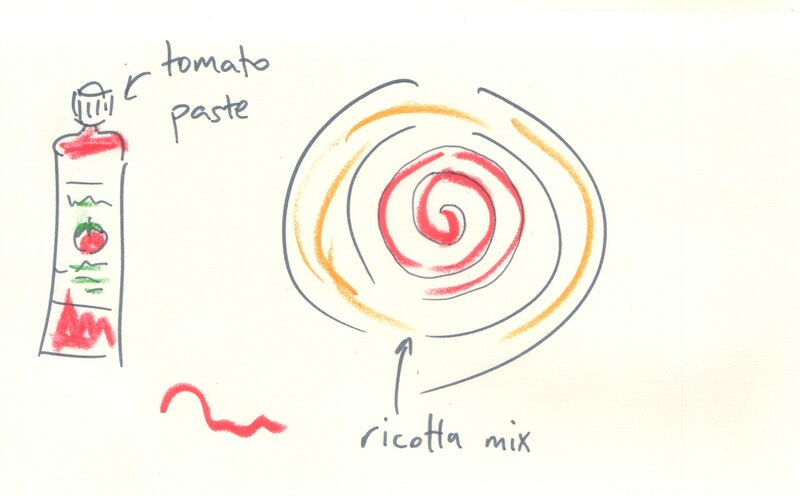 Now use the tube of tomato puree to draw a thin spiral starting from the centre (you won’t need the whole tube). Scatter over pepper slices, mozzarella, olives and torn basil leaves. Don’t forget the almond to play King! Sprinkle a little more salt and pepper. Gently place the other circle over the top. Press down firmly on the border, while using the back of a knife to push in scalloped edges. This will help keep it tightly sealed. Put in the freezer for 15 minutes. Prepare a tray with baking paper. Heat the oven to 180-200C, depending on how fierce it is. Remove galette from the freezer and flip upside down (place tray and paper on top and turn everything over). Generously brush with egg wash, then with the tip of your sharpest knife, score in a pattern or design, without breaking the surface. Stab with a skewer to let the steam out, then pop in the oven. Cook for 40-45 minutes til the pastry is a very dark brown on top. Peek underneath to see if looks cooked as well. Let cool for 15 minutes or so, then dig in!